Welcome to a new Legislative Day in the Senate of the Federal Republic of Nigeria. Senate President, Bukola Saraki took the official Prayer and led the Chambers into today’s proceedings at 11:03am. Senator Rabiu Kwankwanzo moves for the approval of votes and proceedings of Wednesday, 25th of October 2017, Sen. Osinakachukwu Ideozu seconds. Senator Nelson Effiong raises a Petition from his constituency for compensation as a form of host community entitlement. 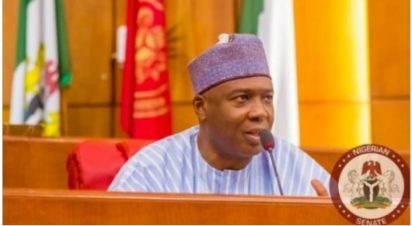 The Senate President refers the Petition to the Committee on Ethics, Privileges and Public Petitions to report back in 2weeks. Report of the Joint Committee on Judiciary, Human Rights and Legal Matters and Anti-Corruption and Financial Crimes by Senator Chukwuka Utazi (Enugu North). Senator Biodun Olujimi seconds that the Senate do consider the report of the Joint Committee on Judiciary, Human Rights and Legal Matters and Anti-Corruption and Financial Crimes on the Proceeds of Crimes Bill, 2017 (SB. 376). The Senate now dissolves into the Committee of the Whole for the clause by clause consideration of the Proceeds of Crimes Bill, 2017 (SB. 376). Senators take turns to contribute to the clause by clause consideration of the Proceeds of the Crimes Bill (SB. 376). The Senate reverts back to plenary and reports progress. The Senate defers further consideration of the Proceeds of Crimes Bill (SB. 376) to another Legislative day. -That the Senate do consider the report of the Committee on Establishment and Public Service Matters on the Chartered Institute of Entrepreneurs (Est, etc) Bill, 2017 (SB. 7). Senator Baba Kaka seconds that the Senate do consider the report of the Committee on Establishment and Public Service Matters on the Chartered Institute of Entrepreneurs (Est.,etc)Bill, 2017 (SB. 7). The Senate now dissolves into the Committee of the Whole for the clause by clause consideration of the Chartered Institute of Entrepreneurs (Est.,etc)Bill, 2017 (SB. 7). The Chartered Institute of Entrepreneurs (Est.,etc) Bill, 2017 (SB. 7) is read the third time and PASSED. Senate Leader moves that other items on the Order paper be stood down to another Legislative day. Minority Leader seconds. Plenary was adjourned to Tuesday, 31st October, 2017.